Sole source of ventilation for a gym. 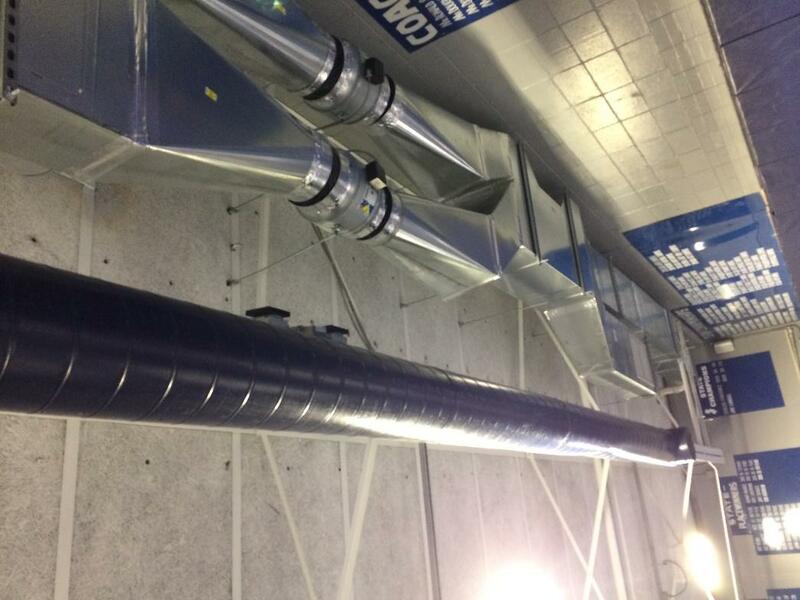 This standalone ERV (energy recovery ventilator) is installed in the ceiling of a gym. The unit, a BPE-XE-MIR-2000, can provide fresh air for over 200 people and is the space’s only source of ventilation for sporting events and typical gym use. The ventilation set-up is a very cost effective way to retrofit an existing school gym without relying on heating and cooling systems, which are often expensive and difficult to install. The BPE-XE-MIR-2000 makes for a simple install where the module is hung from the steel superstructure with a threaded rod and kbar. 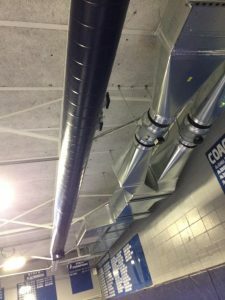 After the unit is installed, it is a simple matter of installing intake ductwork to bring in fresh air and exhaust ductwork to remove stale air from the gym. The BPE ERM (Energy Recovery Module) is effective enough that it can pull in outdoor air at 10ºF and temper it with the exhaust air to provide fresh air at 60ºF to the people in the gym. Due to the superior efficiency of BPE units, additional inline heating or cooling is not necessary for most applications. Two fans are the only part of the BPE ventilation system that need wiring: one fan for fresh air, the other for expelling exhaust. The fans can come prewired with high and low switches and an optional variable speed controller powered by a prewired three-pronged plug. It can be noted that the Energy Recovery Module is mounted 20 feet in the air, placing it out of the way and making it quiet enough that people have trouble telling when the unit is operating!